Expect to be taxed much like a sole proprietor when you work as a 1099 contractor. The Internal Revenue Service (IRS) has a 20 point test it uses to determine whether you are truly an independent contractor and not an employee. It's easier to meet this test, when you're working from home, and can show that you work for more than one company at a time. Know the tax implications of being a 1099 contractor, so that you can plan for and file your taxes correctly. As a 1099 contractor, you have to make quarterly tax payments to the IRS, unless an exception applies. You're not an employee, and therefore there's not employer to withhold those taxes from your paycheck. You can avoid quarterly payments, known as estimated taxes, if you don't owe more than $1,000 in taxes. The only way to determine that is to guess what you'll owe in taxes for the tax year, based on tax credits you received the previous year. You can also compare your household income for the tax year before you became a 1099 contractor, to what it is now, to see whether you'll owe more or less in taxes. You're also expected to pay social security taxes as a 1099 contractor. If you worked for an employer before, you're used to seeing your portion withheld from your paycheck. The employer had to pay their half of the taxes too. You have to pay the entire 100 percent of social security taxes now, but you are allowed to deduct 50 percent of the employer's portion from your taxes. You won't have to pay social security taxes at all, if you make less than $400 after you take all of your business deductions. The amount you have to pay in social security taxes is 12.4 percent of your income. You also have to pay Medicare taxes, which is 2.9 percent. The total payment for both is 15.3 percent of your income. 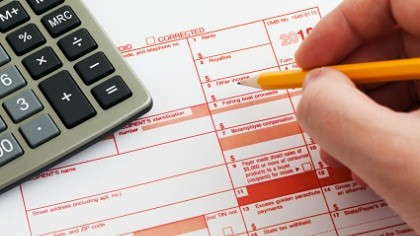 Business deductions reduce your tax liability, and you should take what you can. Don't forget your income tax payments. You'll have to fill out a 1040 Form as usual, and you don't want to spend your income each month and forget to save up for income tax payments, which are due April 15th every year. You should consider saving a percent of your gross income to pay for taxes. It depends on your annual income, but some 1099 contractors save between 20 and 40 percent of their gross income each month to cover self employment taxes and income taxes. If you don't plan your tax payments, you'll end up owing higher tax fees than you would if you were an employee. The penalties and interest that the IRS charges can cripple any efforts to make a living from home. Avoid tax problems, by understanding the tax implicatiions of a 1099 contractor.